Are you looking to make Circle Time a special time in your day care? This section will be of help to you. Sitting in a circle and learning and sharing is a great way for the whole group to be involved in one activity. I’ve always planned this activity for after breakfast and once the bigger kids are on the bus. It's a great way to transition from one activity to another. What is the purpose of Circle Time? This is an activity that serves several functions. This is a teaching time, but try to refrain from too much behavior correcting during this time. Take this time to notice the positive and encourage (never push) all children to participate. Time spent on this activity will help children to learn behavior skills, such as sitting and listening, that they will need for years to come. All activities at this time, however, should not be children passively listening. This is a time which should actively involve the children. They will learn social skills such as active listening, sharing, and participation in a large group. This is also a good way to introduce a new learning concept to the whole group at once. Ways to make it easier : Plan your activities for this time in advance. Make sure you know the words to any new songs, have all the necessary pieces for a flannel board project, etc. You don't want to be floundering while the children are waiting. Have a special place for Circle Time. I have carpet squares I lay in a circular pattern on the living room floor. The carpet squares are in place before the children arrive in the morning. Because Circle Time is at the same time every day, it creates a sense of predictability that the children can count on. More often than not, they will gravitate to their mats at the correct time without reminders. Circle Time is easier if the children are all at the same stage of development. It can also work well with children of various ages. You'll just need to plan to include different ages, stages of development and different learning styles. Alternate quieter activities with more physical activities. Start slowly... with a song or sharing activity. Don't jump right into the main activity. This way you are setting the stage for children to be ready and willing to learn and participate. 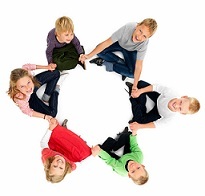 Circle Time length will vary according to the ages and temperament of the children involved. If the children are actively engaged the time will fly. If the children are quite fidgety then a shorter time may be called for. Most often this is a 15-20 minute activity for preschoolers and less time for toddlers. What's missing? Place several small items on a tray. Show the children each item and name it. Place a towel over the tray and remove one item. Remove the towel, and let the children guess which item is missing. My favorite thing. Name a subject (toy, book, color, candy, food etc.) Have the children take turns telling the group what their favorite is and why. Dress up game. Fill a bag with dress up items like sunglasses, hats, scarves, vests, gloves etc. Play some music and have the children pass the bag around the circle. When the music stops the child holding the bag must take one item out of the bag (without looking...what you grab is what you get) and put it on. Children really like this game since they start to look pretty silly by the time the bag is empty. This might make a good introduction to dramatic play. Dog/Cat chase. With all the children in a circle, give one child a stuffed cat to pass to the child next to him. Let the cat go around the circle a couple of times. Then give another child a stuffed dog to be passed around the circle in the same way. The object is to see if the dog can catch the cat. This results in a lot of giggling. Copy Cat Bear. Use a stuffed bear on your lap. Have the children stand in a circle and copy the movements of the bear. Have the bear jump in the air, touch his toes, put his hands on his head, clap hands, stomp feet, wave his hands in the air, etc. Or… play music in the background and make this a musical activity. Mat change. Have everyone stand on their mat. Call out common things like, "I like peanut butter", "I like watching butterflies", "I like riding the merry-go-round", "My favorite ice cream is chocolate", "I have a pet at home", etc. The children who can answer yes to the statements must change places with someone else who does too. This is a good way for the children to learn basic things about the other children. My Choice. Make cards using pictures to represent various nursery rhymes and songs. Choose the ones the kids seem to enjoy most. Let one child per day choose a card for the start of Circle Time. Everyone participates in the rhyme or song. How Many? Fill a jar with one type of candy. Count the number of candies in the jar. At Circle Time ask the children to try and figure out how many candies are in the jar. Let each child have a guess. Let them know the real answer. As a special treat, give them one or two candies from the jar. OR… use buttons, cloths pins, or any small item you have several of. How Long is a Minute? Two Minutes? Use a watch with a second hand and ask the children if they know how long one minute is. Tell them when to start and ask them to raise their hand when they think a minute has gone by.